Online lotteries are increasing in popularity and are fast becoming a multimillion dollar industry worldwide. 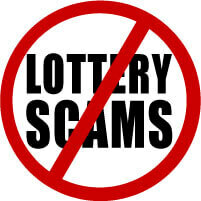 The unfortunate dark side of this increasing popularity is the rise of lottery scams. These fraudsters have duped many innocent people of their hard-earned money. There are large numbers of email lottery scams, many of which the authorities are unable to investigate owing to logistical issues. Online users therefore have to be very wary and not fall prey to such scams. The most popular type of lottery scam is a form of '419' advance fee fraud. You may get an email out of the blue stating you have won a cash prize for a lottery you have never entered. Usually there is a demand for fees (imaginary courier fees, taxes, customs duty, shipping, etc) that need to be paid before the winnings are made available. This request for money will usually provoke an emotional reaction which in turn will make you send your bank details, address, credit card or personal information. In addition to fleecing you of money, these emails may also contain viruses or unwanted software which could harm your computer. In the email you will be asked for personal information such as bank account, credit card number, passport number, driver's license numbers or any such personal details. In the email you will be promised a prize that you supposedly have won in a lottery. (No legal lottery solely notifies the winners in an email). Often the language used is very poor (bad spelling and grammar) and no specific details are given about the rules or how it works. The fraudsters promise to send the prize to you after a transaction fee or some kind of payment is paid to them. This is never asked for by legal online lotteries. Lottery fraud can be easily prevented in a number of ways. 1. Do not click on links in an email if you are suspicious of the message. 2. Do not respond to emails that are sent by unknown people to you. 3. Report any such messages to your ISP. 4. Never disclose personal or financial information about bank accounts, credit card details, and address to any unknown email sender as it can lead to identity theft. 5. Add a spam filter to your email inbox. 6. Never pay any advance sum of money to receive your prize. 7. Do not complete any online claim forms. Lottery fraud can be prevented by following the guidelines given above and by participating only with established and trusted online lottery brands.